Since the beginning, more than 93 universities across North America and 16,500 students have participated in AVTCs. 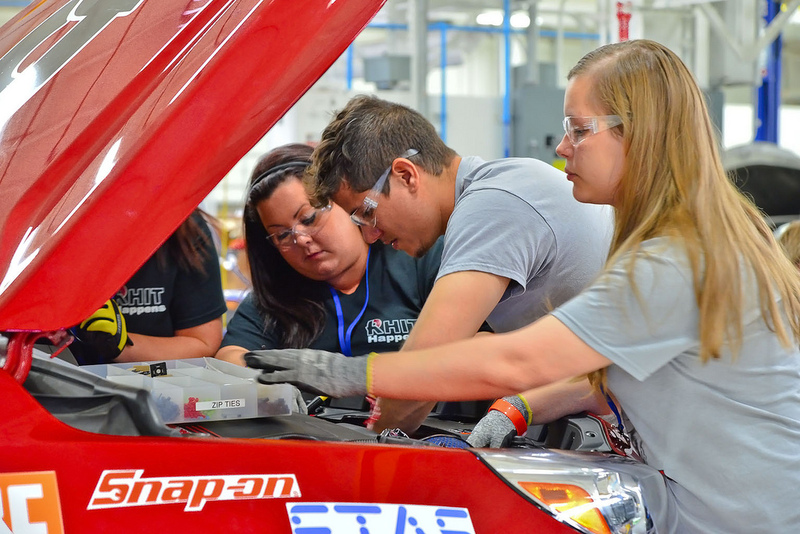 Each year, 200-500 students join forces in AVTCs mission of educating the next generation of automotive engineers and advancing state-of-the-art fuels and vehicle technologies. Vehicle Design: The CSULA EcoCAR 2 Team built a Parallel through the Road Hybrid Electric Vehicle. The vehicle had an engine in the front running on E-85 and an electric motor in the rear of the vehicle. The vehicle also had an on-board charger that allowed the user to recharge the batteries. This would allow the user to only use electric power when traveling short distances. The parallel hybrid system under consideration contained an electric drive motor on the rear axle and a standard internal combustion engine operating on the front axle. This is similar to a standard internal combustion engine vehicle (with engine, differential and gearbox in front) supplemented with an added electrical power-train operating on the rear axle. The two subsystems would combine to produce mechanical power to the wheels as well as regenerative charging for the battery stack. The A123 Lithium-ion battery pack provides 16.2 kWh of battery capacity to give the vehicle an electric-only range of over 20 miles. Vehicle Design: The CSU Vehicle Innovations Team (VIT) built a fuel cell plug-in hybrid electric vehicle (FCPHEV). This fully functioning, front-wheel-drive electric vehicle was powered by a Unique Mobility 145 kW electric motor and an 18.9 kWh lithium-ion battery from A123 Systems. With these components, the vehicle had up to 55 miles of all-electric range for commutes and short trips. For longer trips, a small, high-efficiency, hydrogen fuel cell supplied additional energy to achieve a total driving range of more than 200 miles. Although the selected architecture did present a myriad of design challenges, its advantages are significant. Compared to other PHEV technologies, the FCPHEV’s high efficiency, low well-to-wheel emissions and negligible use of petroleum made it superior. Compared to pure electric vehicles, the hydrogen system not only provided additional driving range but also enabled fast refueling while maintaining zero tailpipe emissions. This unique combination of advantages embodied the CSU team’s vision for the future of transportation: A vehicle with high efficiency, low emissions and full functionality. 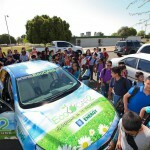 Vehicle Design: The EcoEagles’ vehicle was a Series Plug-in Hybrid Electric Vehicle (PHEV). The electrical half of the vehicle used a lithium-ion battery pack from A123 and an AM-Racing, Remy Electric Motor to propel the EcoEagles’ vehicle for 35-42 miles per charge. The mechanical half of the vehicle consisted of an efficient General Motors 1.7 L diesel engine that utlilized a 5-gallon reservoir of B20 biodiesel (20% processed vegetable oil, 80% diesel) to maintain the charge on the battery pack. By using the electric motor and diesel engine in the PHEV format, the EcoEagles’ vehicle got an estimated 105 MPGe. Vehicle Design: The team’s selected architecture was a Series Parallel Plug-In Hybrid Electric Vehicle (PHEV). MSU’s series-parallel PHEV switched between operating as a series and a parallel hybrid. The team’s vehicle was capable of recharging from the electric grid. 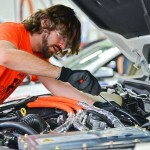 The vehicle would drive using the electric motor until the battery had been depleted. At this point, the engine would begin powering the car and maintaining the battery and the car will function as an extended range electric vehicle. This design allowed the vehicle to drive more like a conventional vehicle and not suffer from the limited range associated with EVs. The vehicle was be fueled by ethanol, or E85, and electricity. It used energy taken from the electric grid through plug-in charging to propel it for the first 60 miles. Its electric powertrain consisted of a lithium-ion battery donated by A123 Systems and a UQM 145 kW permanent-magnet, brushless DC traction motor. Once the battery had been depleted, the vehicle’s turbocharged GM 1.4 L engine would power the wheels, providing extended range. Both the electric traction motor and the engine transmitted their power to the wheels through a six-speed automatic transmission. This architecture allows for an all-electric range, which is crucial in reducing oil dependency, and offers a very high efficiency once the battery is depleted and the car is running on liquid fuel. Vehicle Design: NCSU designed a series plug-in hybrid electric vehicle (PHEV). The primary source of energy for the GM-donated Chevrolet Malibu was from a battery pack that was able to be charged from the electric grid. This power was transmitted to the road through an electric motor. After about 45 miles, when the battery pack’s state-of-charge becomes low, an on-board Kubota biodiesel engine would turn on, powering a generator that would take over running the electric motor, which would charge the battery and supply enough power to keep the vehicle moving. Vehicle Design: Ohio State University’s vehicle architecture was a parallel-series plug-in hybrid electric vehicle (PHEV). It featured an A123 18.9 kWh battery pack that was used with an 80 kW peak electric machine on the rear axle to provide power to the rear wheels through a single-speed gearbox. The vehicle’s front powertrain utilized a 1.8 L, high compression ratio engine recalibrated to run on E85 fuel and an 80 kW peak electric machine to provide power to the front wheels through a six-speed automated manual transmission. The vehicle was capable of operating in charge-depleting, charge-sustaining series and charge-sustaining parallel modes. Vehicle Design: The Penn State University Advanced Vehicle Team (PSU AVT) designed a series plug-in hybrid electric vehicle (PHEV) fueled by E85. The re-engineered 2013 Chevrolet Malibu used a front-wheel-drive system powered by a 90 kW Magna E-Drive motor to supply the propulsion for the Malibu. The PSU AVT vehicle had an auxiliary power unit consisting of a Weber MPE 750 engine fueled by E85, coupled to a UQM PowerPhase 75 generator to supply DC power to the high-voltage bus. The vehicle used lithium-ion-phosphate batteries to form the basis for the energy storage system. Vehicle Design: The Purdue EcoMakers selected a parallel-through-the-road (PTTR) plug-in hybrid electric vehicle (PHEV) as their final EcoCAR 2 architecture. The vehicle could be plugged into a standard wall outlet to charge a high-energy-capacity A123 Systems battery, and it could run in electric-only mode. With a 45 kW Magna E- Drive motor, the vehicle was propelled solely by the electric rear drivetrain. The 1.7 L diesel engine, which operated the front drive train, helped power the vehicle if the acceleration demand was higher than what the electric motor could provide. Once the battery charge was depleted, the front drivetrain would take over, and the vehicle would be powered solely by the B20-capable diesel engine. The rear drive train would continue to function for regenerative braking and to supplement the engine for brief periods when the acceleration demand was high. Vehicle Design: Team Tennessee’s EcoCAR 2 vehicle was a series-parallel plug-in hybrid electric vehicle (PHEV), consisting of a 2.4 L LE9 engine fueled with E85 (85% ethanol and 15% gasoline) coupled to a UQM SR218H generator. Ethanol is a domestically produced, renewable fuel which has reduced lifecycle greenhouse gas emissions when compared to gasoline. The rear drive consisted of a Remy HVH 250-115S motor mated to a BorgWarner eGearDrive. The energy storage system consisted of seven 15s2p modules from A123 Systems, providing a nominal 340 volts with 40 Ah capacity. The vehicle had a 34.4 mile (55.4 kilometer) charge-depleting range, after which the vehicle may be operated as either a series or parallel hybrid. The series-parallel architecture allowed for a blended energy consumption strategy which maximized power efficiency with both series and parallel modes. Series mode allowed the engine to operate at the highest efficiency point, and the electric vehicle operation could be carefully brought online to optimize catalyst warming and reduce emissions. In parallel mode, the engine was tied directly to the front wheels, and the electric motor drivetrain powered the rear wheels. At times of peak power demand, the vehicle would use both series and parallel modes in combination. Vehicle Design: The team competed with a series-parallel plug-in hybrid electric vehicle (PHEV) architecture. A high-capacity battery pack was built, using lithium-ion modules donated by A123 Systems, to store energy from the grid. A Magna E Drive system mounted in the back of the vehicle conducted this energy to the rear wheels and provided them with motive power. This unit combined a 100 kW electric motor with a differential, an inverter and all cooling and related systems into a single unit, thus reducing the amount of system integration work required. To propel the vehicle when a high level of power was demanded and to extend the vehicle’s range, a GM 2.4 L E85 engine – with a TM4 37 kW electric motor coupled to it – would be mounted in the front of the car. Using this vehicle architecture provided a full spectrum of propulsion options to address any driving situation, from electric-only operation, to mild hybrid belt-alternator-starter (BAS)+ functionality, to series hybrid operation. 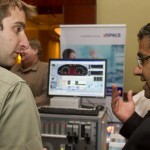 The control strategy incorporated both off-line and real-time optimization and optimal control, derived from ongoing research at UVic, to maximize the vehicle’s efficiency. Vehicle Design: The UW engineers developed a parallel through-the-road (PTTR) plug-in hybrid-electric vehicle (PHEV) architecture. The team used a variety of tools and methods to select this final architecture, which was chosen as the best combination of efficiency and feasibility for the UW team. A Remy electric traction motor, assembled by AM Racing, was fitted to the rear of the vehicle to drive the rear wheels. An electric energy storage system from A123 Systems was installed in the former spare tire well to provide power to the rear electric traction motor. Up front, a biodiesel GM 1.7 L diesel engine powered the car after full charge depletion. Even after the vehicle entered this charge sustaining mode, the electric motor could still be used to assist the engine and increase the overall vehicle efficiency. Vehicle Design: After completing an exhaustive design process, the team selected an E85 series plug-in hybrid electric vehicle (PHEV) architecture for EcoCAR 2. An 18.9 kWh battery from A123 Systems powered two TM4 motors, which together were capable of delivering more than 280 horsepower to the wheels. The vehicle had an all-electric range of 60 km and could be recharged using a standard wall outlet. If the battery was depleted, a 2.4 L E85 compatible GM-donated engine would come on line, providing power via an electric generator to extend the vehicle’s range. The team selected these vehicle specifications on the basis of real-world driving habits and consumer feedback. By designing a vehicle based on driver needs, University of Waterloo Alternative Fuels Team (UWAFT) hoped to push green vehicle technology into the mainstream automotive market. Vehicle Design: For the EcoCAR 2 competition, Hybrid Electric Vehicle Team (HEVT) chose to design and build a series-parallel plug-in hybrid electric vehicle (PHEV). This type of vehicle used two different energy sources — an engine and two electric motors — to operate efficiently, maintain low petroleum energy consumption and have a low impact on the environment. With this vehicle, the HEVT would be able to plug in and recharge the onboard battery pack with grid electricity, allowing the car to operate in all-electric mode. Since the vehicle attained only about 45 miles on a single charge, the HEVT team added a GM 2.4 L flex fuel engine that used E85 ethanol to extend its range. This engine would start automatically when the battery charge runs low, so the vehicle could operate solely on fuel energy until the next time the battery is recharged from the grid and all-electric mode can resume. By using these two energy sources to produce the series-parallel PHEV configuration, the HEVT achieved efficient power transfer to the wheels as the engine and electric motors were combined at different times. Vehicle Design: The WSU vehicle architecture was a Parallel through the Road (PTTR) plug-in hybrid electric vehicle (PHEV). The team used a GM-donated 2.4L engine with E85 fuel to drive the front wheels and a Remy HVH250-115P electric motor to run the rear wheels. The motor power was supplied by a 19kWh A123-donated battery and controlled by a Rinehart Motion Systems PM150DX controller. The dual independent drivetrain gave the driver plenty of operational flexibility, great performance and very good fuel economy with low emissions. The vehicle is nicknamed “E2D2″ for Ethanol Electric Dual Drivetrain. 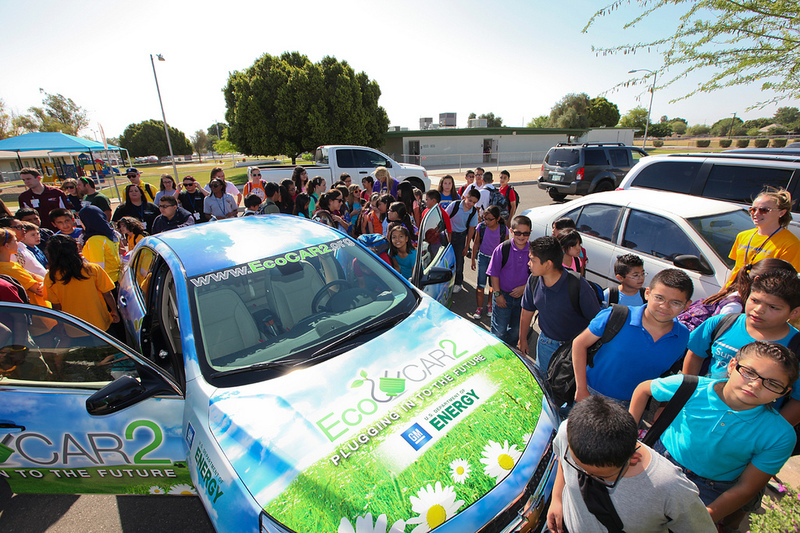 EcoCAR 2 taught me the vehicle development process (VDP) on how industries bring a car from the drawing boards to reality. 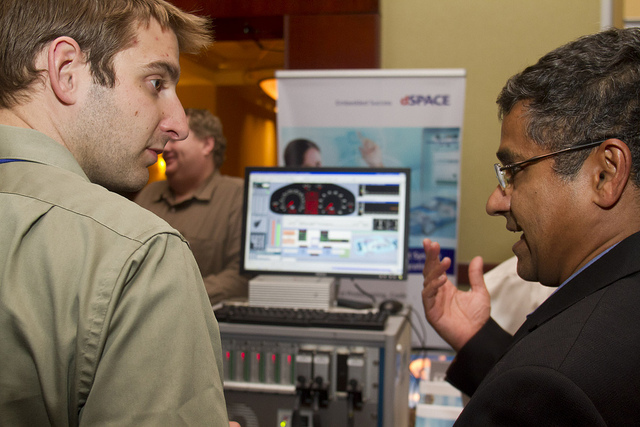 It showed me the value of countless hours of design and simulation that allow developers to optimize the vehicle’s performance in desired areas. 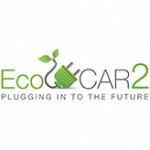 EcoCAR helped me because it provided real world experience where I had a chance to create practical, safe and effective designs and really get the whole picture of what goes into a plug-in hybrid vehicle.